I suppose this goes without saying, but think about what it’s like to get stared down. This will happen – every time you are in public. Like anything out of the ordinary, people naturally stop to gawk. You’ll cause curiosity delays wherever you go. What’s funny is that you’ll be confused why people are staring at you because you’ll forget you have purple hair. My advice is to turn this into an opportunity to smile and say hello. Before others get to the judging stage (see below), set the tone for how you’d like to be perceived. People look at and place judgment on each other all day, every day, whether we realize it or not. However, we don’t usually judge others so outwardly that our target catches a glimpse of it. When you rock purple hair, others’ stares oftentimes turn into quick judgment. You’ll see in their eyes that they are formulating an opinion about who you are, what type of life you live, and what you stand for. I’ve heard my look described as a Mermaid, My Little Pony, Rainbow Bright, Malibu Barbie (no idea where this one came from), and more. I’ve come to realize that others’ judgment is simply a reflection on themselves – how they would handle (or not handle) whatever is different about them. They can’t imagine stepping outside of what is typical, and having that be accepted by others. “I love it, but I could never have the guts to do it.” You can show them that indeed, atypical can be perfectly acceptable – if not revered. Be open when others open the door to talk about what your life is like. You will smile to yourself as you tell them Yes! I work in a regular office with regular people, and regular bosses – just like you! Use this as your chance to show proof that creativity and individuality have seats at the table, along with maturity, kindness and professionalism. People will smile at you. Not everyone will judge you skeptically or negatively. Some people will just get it and smile at you. And some people will go out of their way to tell you how super cool your hair is! We don’t often enough take time to give compliments to people we know or to complete strangers. Purple hair breaks the ice. Passers-by will stop you just to say something nice, and you will learn to accept compliments. Love that you are doing something awesome, smile, and say thank you. 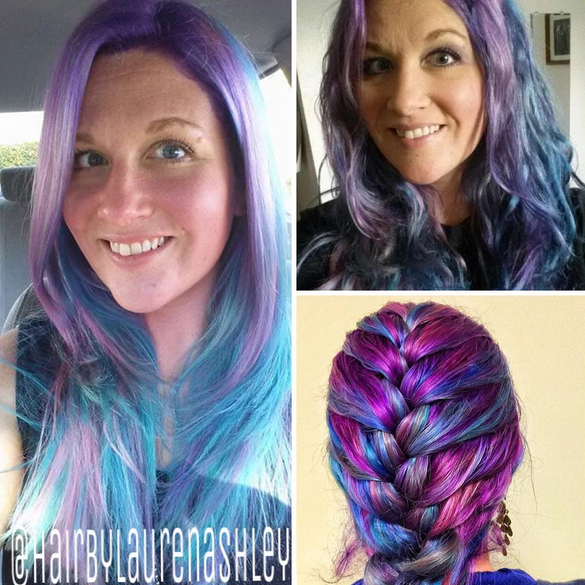 Side Note: If you’re curious about my stylist and product preferences, visit Hair by Lauren Ashley on Instagram. We use Pravana ChromoSilk Vivids Locked-In colors.